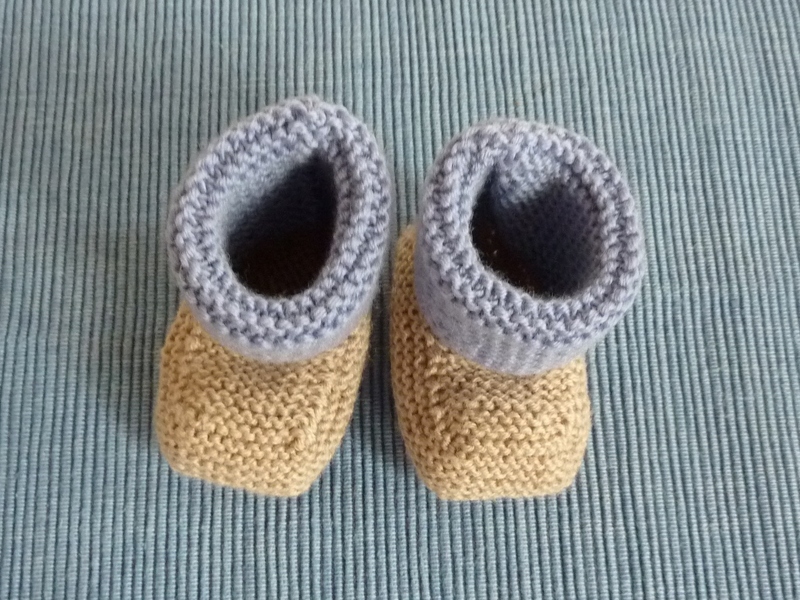 I’ve been meaning to make these stay-on-baby booties for quite a while, I added them to my Ravelry queue probably two years ago. And this Saturday I finally decided to make them, and what do you know, I finished them the same day. They are just that simple to make. 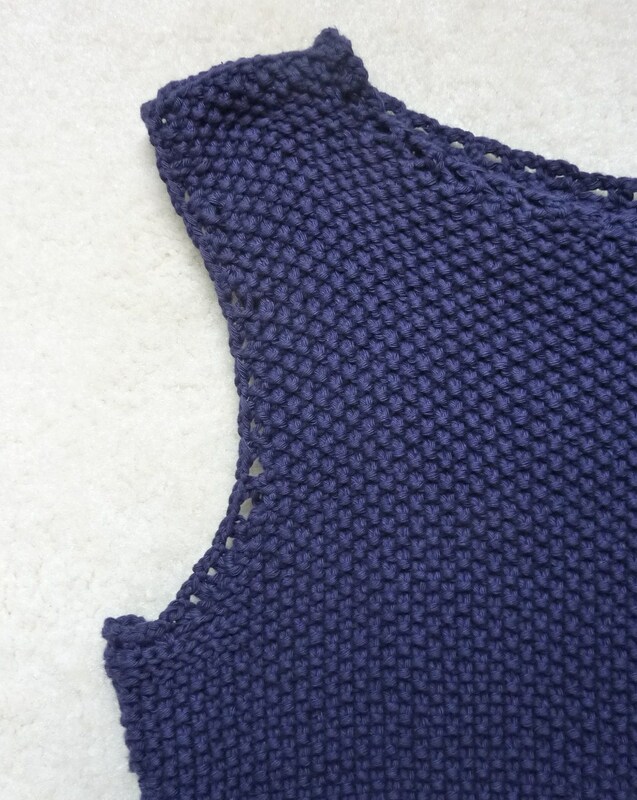 The pattern is simply fantastic and really easy to knit. 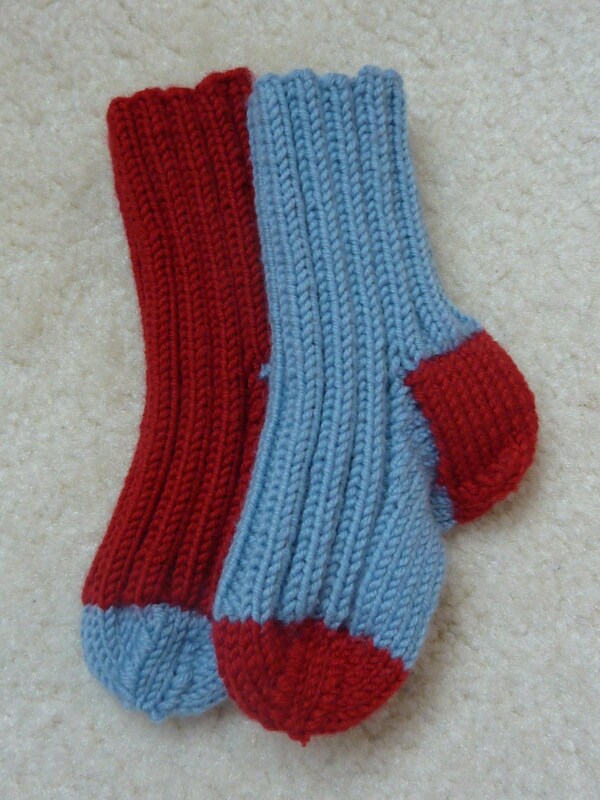 It can be found on Ravelry. 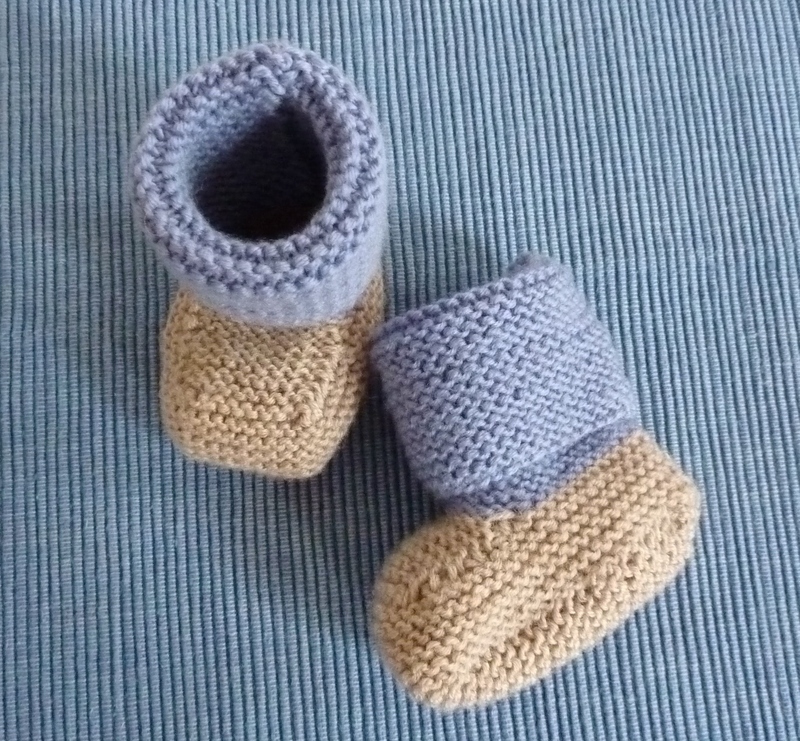 I love that I can simply use my leftover yarn of any thickness and colour and create these. 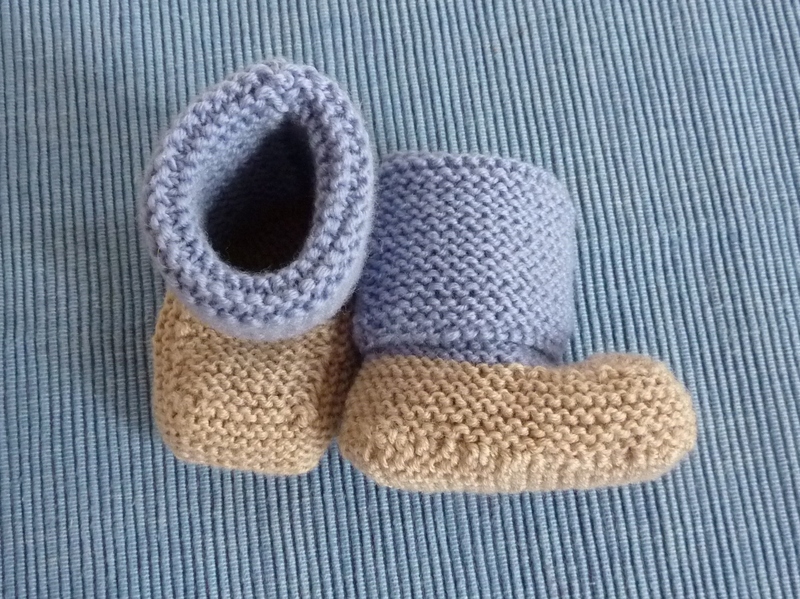 According to the designer they are also the best booties to stay on a little while, I’d like to think that mine do the same, but it’s always good to have two options. They actually look relatively big on these pictures, but in fact they’re quite small, so I think they’ll only fit our little bundle of joy for a month or so…unless they stretch a bit. I made this scarf for a friend late last year. 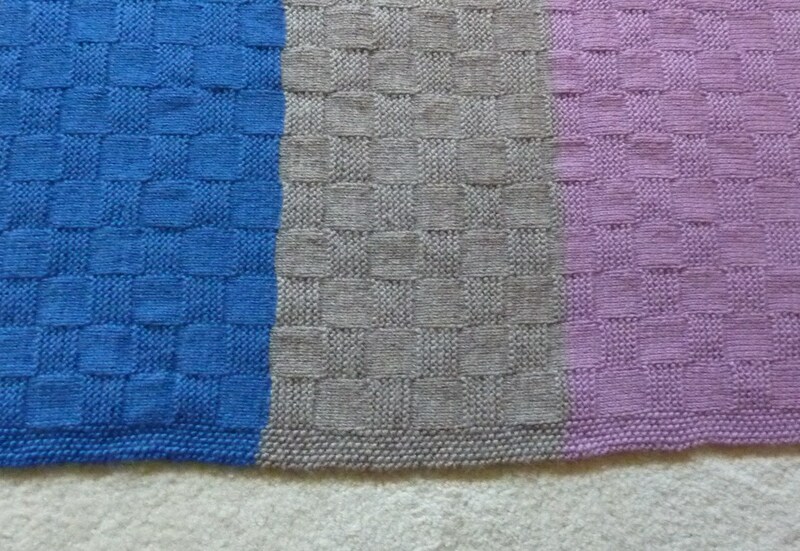 She liked the baby blanket I made for Baby Prasad, I don’t think I’ve added that on here yet, which I will do soon! 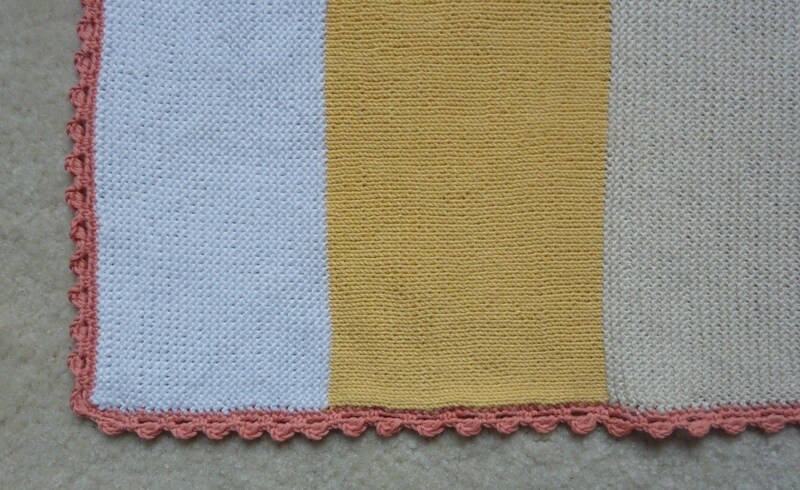 Good colour combination, which is basically repeated on the other side and the length turned out perfectly. My friend told me that her boyfriend often steals the scarf from her as it’s so warm and snuggly. I often get quite hot in winter, but after the winter we’ve just been having I think I might make myself a scarf like this to keep me warm next year! My lovely colleagues threw me a bit of a baby shower at work today, during our lunch break, it was so sweet and they gave me a huge pile of presents. I got some hats, socks, onesies and a jumpsuit. 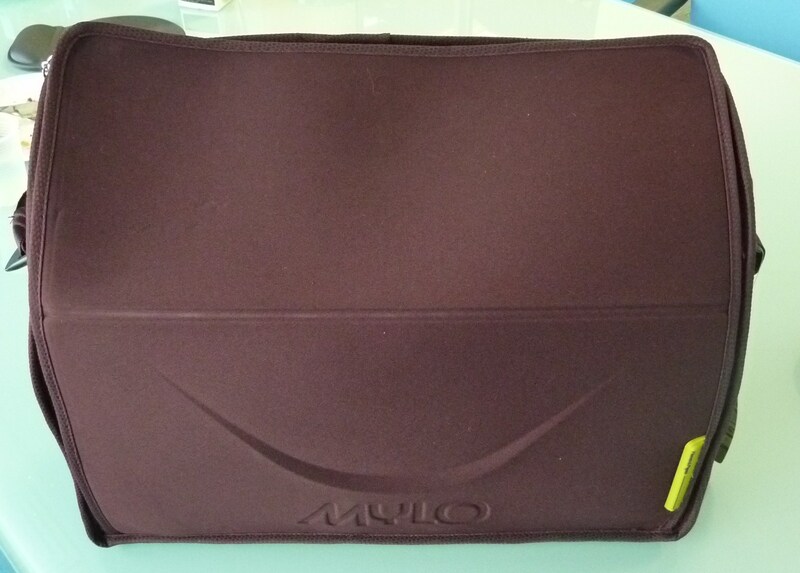 They also gave me this gorgeous nappy/changing bag. Isn’t it gorgeous? I love the colour! 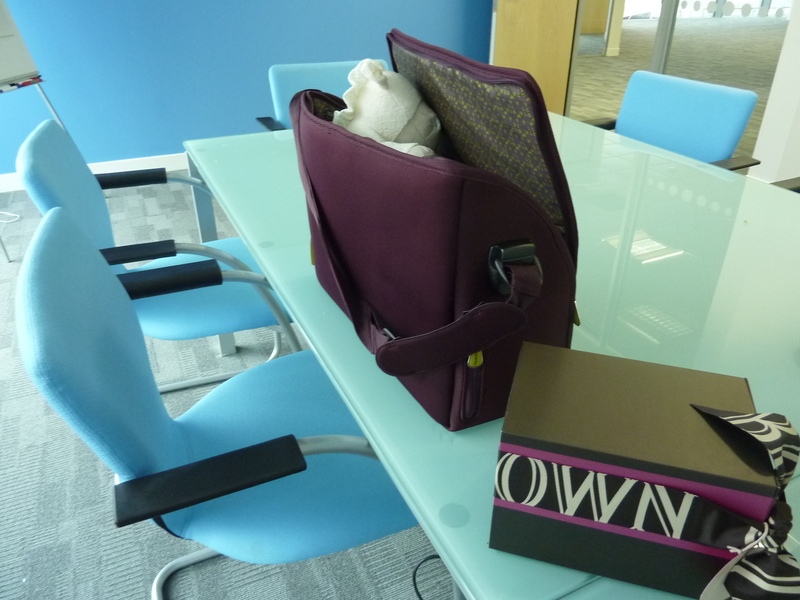 I did also receive a great box of Molton Brown goodies that will help me pamper myself next week when I start my maternity leave. 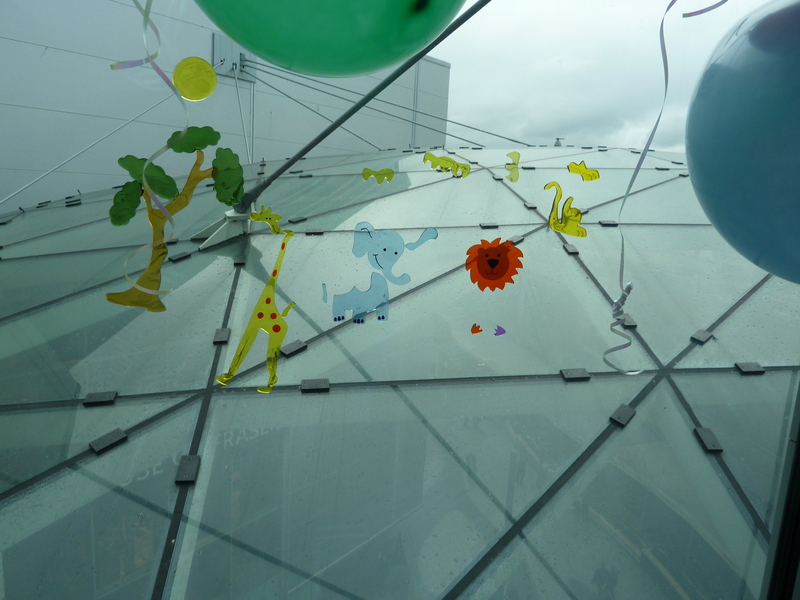 And look at the cute window animals they gave me, they’re going to look fantastic on the nursery window. 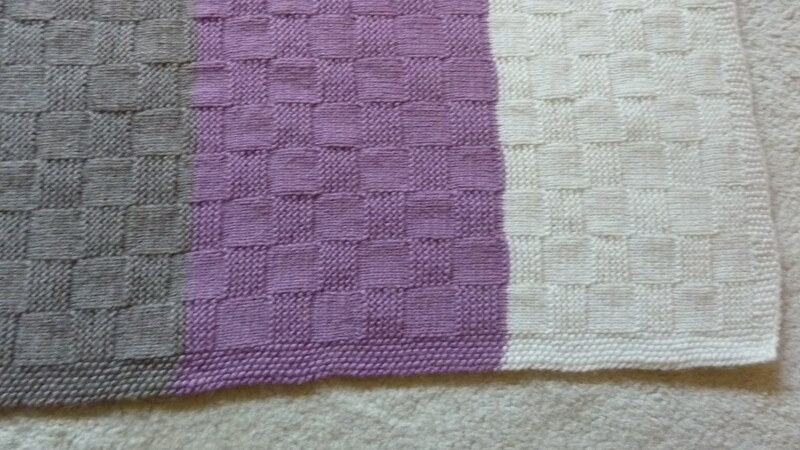 This is another one of my baby blankets that I made for a friend probably over a year ago, shame on me that I’m only adding it on here now! 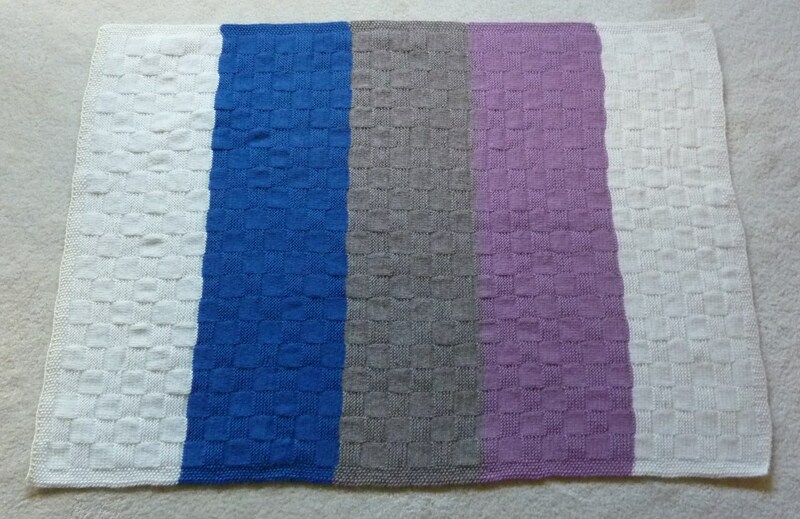 My friend asked me to make two of these blankets, one for herself and one for her brother. It was quite funny because neither one had kids yet or was pregnant, but she loved them so much when she saw some that I was making for other friends that she asked me to make her two as well. I remember when she was picking the colours, I think she took pretty much one entire evening to pick the right ones. I do think they work extremely well and would be fine for a boy or girl! I also decided to change the stitches up a little bit, so used moss stitch on the border and then a combination of purl and knit for the actual body of the blanket. If you look closely you can see that the white is changed a tad at the end, that’s because I actually ran out of the normal white that I was using. I don’t think it’s that obvious though, and I’m probably the only one that notices it. These blankets always take quite a while, but they’re definitely a hit with people. I always hope that they may become a baby’s security blanket or something like that and that they become a real keepsake. 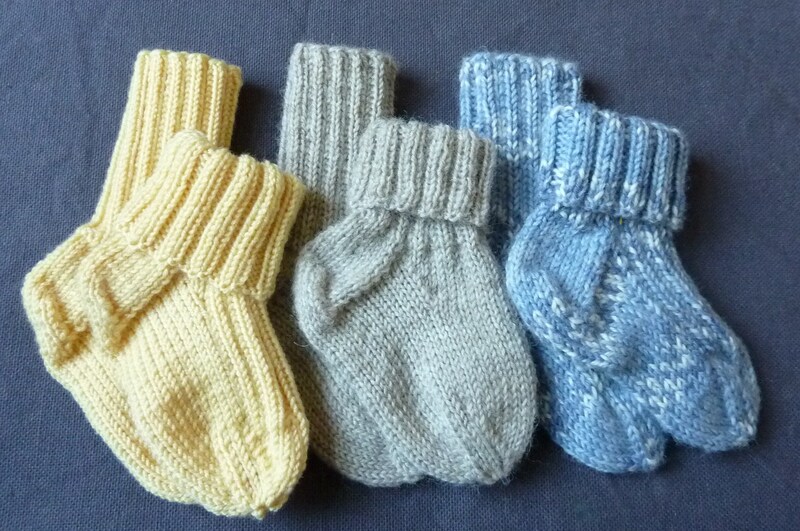 I’ve been told that one can never have too many socks for a little one, which is part of the reason why made a number of different ones. Mostly they’re from the same pattern, but I made sure that they’re in different colours, to keep it interesting. I’ve heard that they fit really well and don’t fall off very often, which is always a good sign. I wouldn’t want our little one to get cold feet. 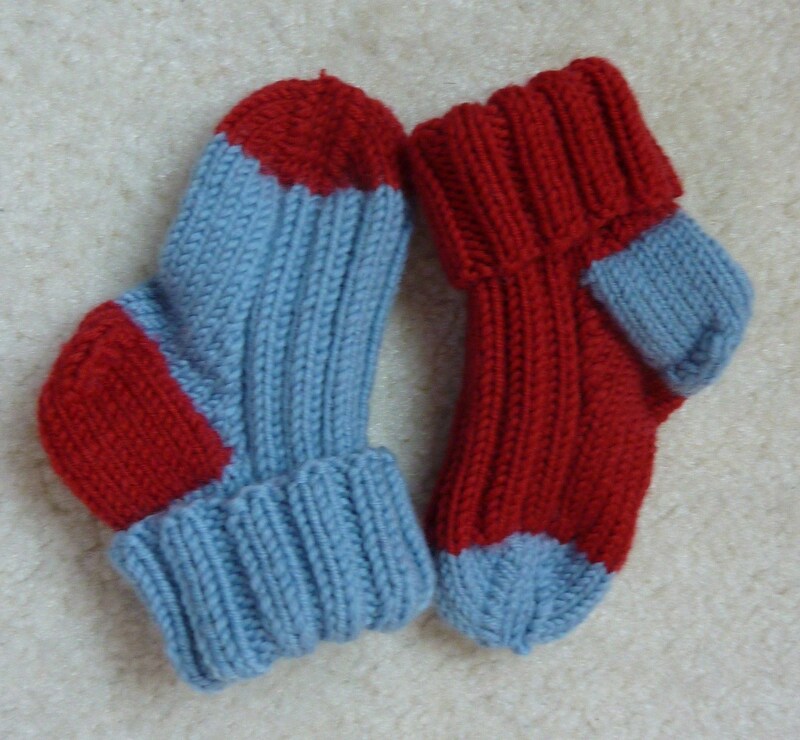 I like these ones, as I was able to use quite a lot of my leftover yarn for these. Plus, I think that blue would work for either a little boy or a girl. I’m still not 100% sure that it’s definitely a boy. After all if the sonographers got it wrong three times, they might have also got it wrong the last time. Not that it really matters, as long as little one is healthy! These are from a stash of Drops Alpaca, so are extra, extra soft. 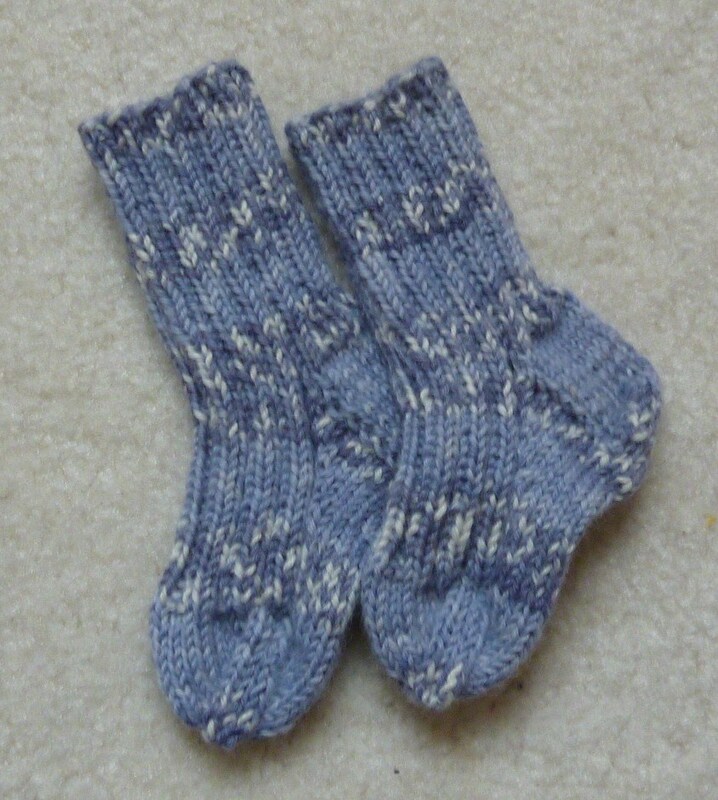 I decided to not knit in rib for the top of the sock, just to make them look a little bit different. I think it works well, but maybe they just look a little bit on the bigger side. Nonetheless, I’m sure they’ll be fine once they’re on. 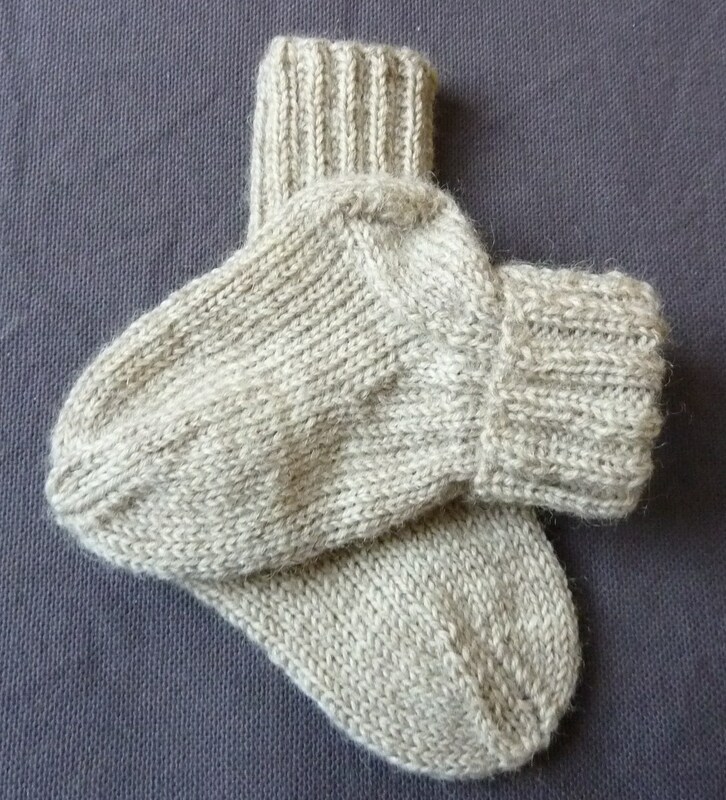 And here’s another pair made from another leftover stash of yellow Drops Alpaca, so they’re super soft! 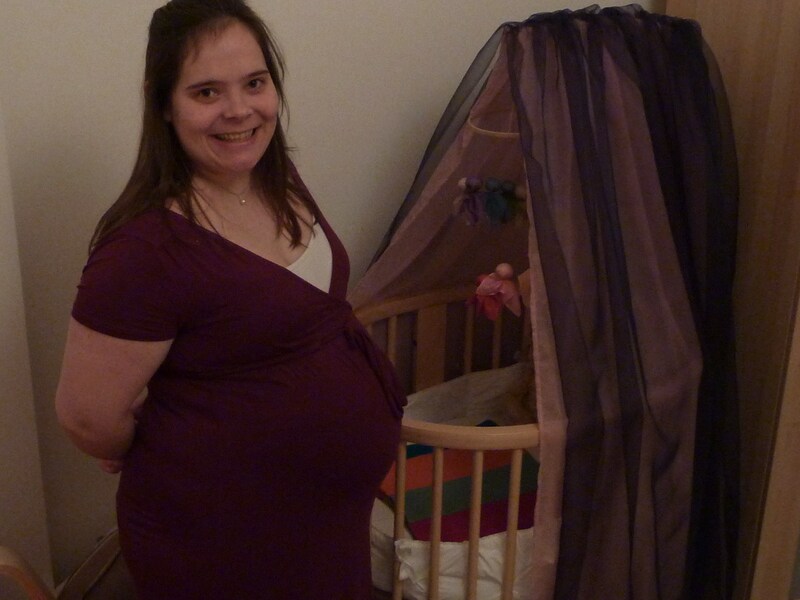 Just waiting for little one to arrive now :-). 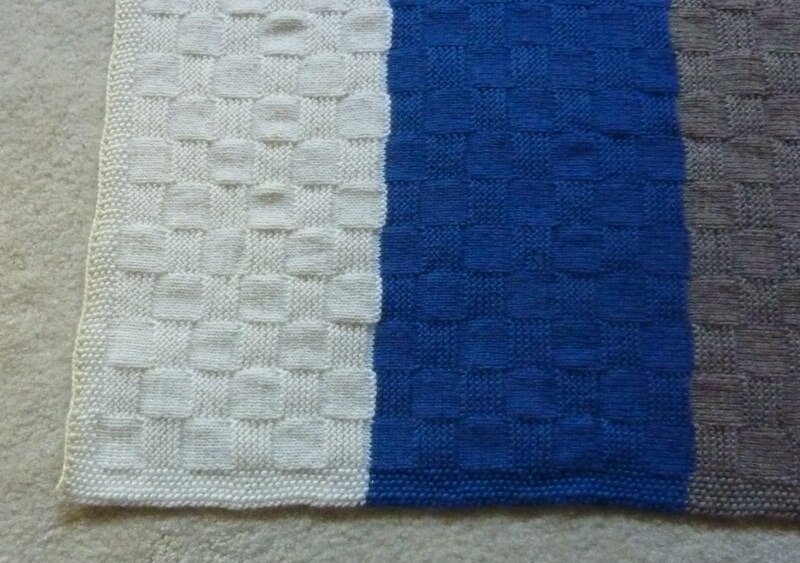 Here’s a cotton blanket I finished for a friend of mine in Singapore, hence the cotton. Her husband is my man’s good friend from University, they were a little group and called themselves ‘The Hornets’. Funnily enough we’re now the first ones to have a baby and now my friend in Singapore with her husband are also expecting a little one, a little girl. I followed the colour choices that our friends are decorating the nursery with and I actually think it worked out really well. 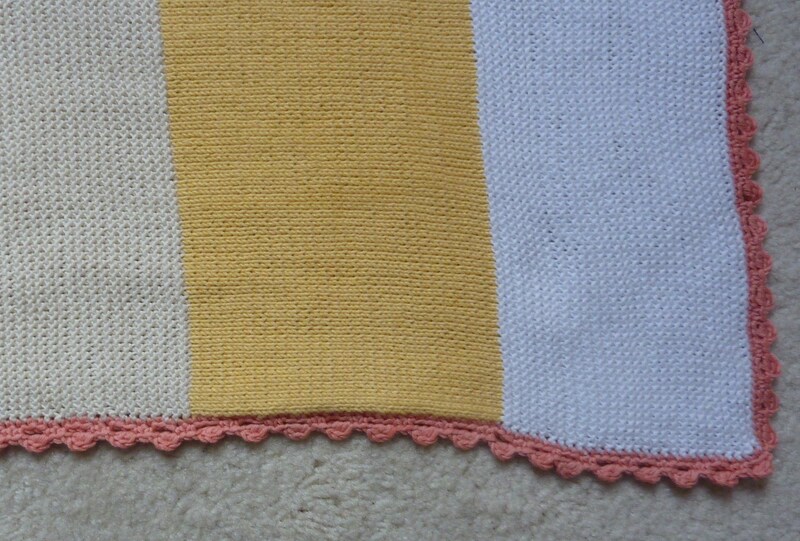 I also added something new to the blanket with the crochet border, which I think makes it extra special. 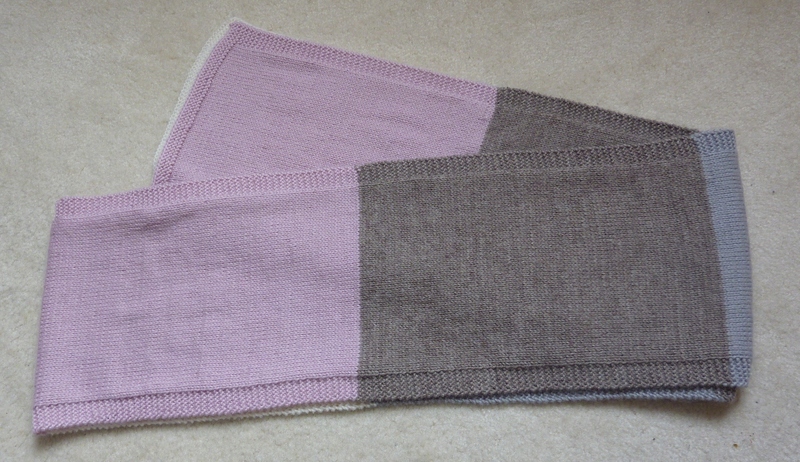 I also decided to use different stitches for each colour, with some purl, some knit and some moss stitch. 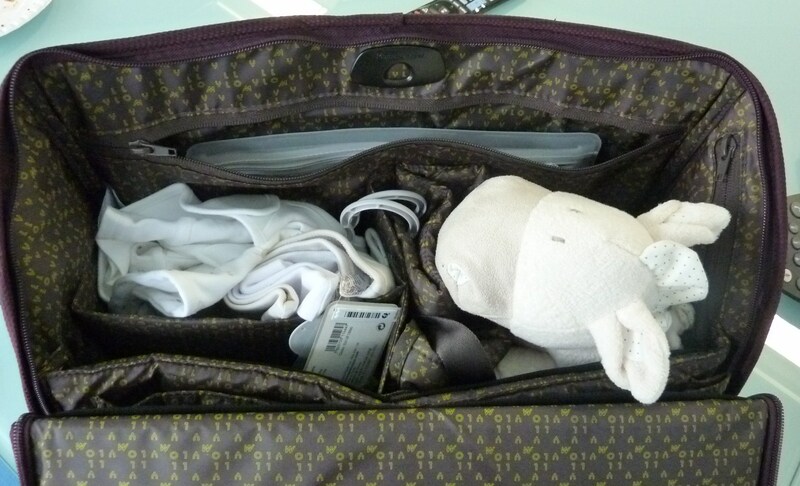 The reason I used cotton is because it’s rather warm and humid in Singapore and I wanted to make sure that our friends are still able to use the blanket. 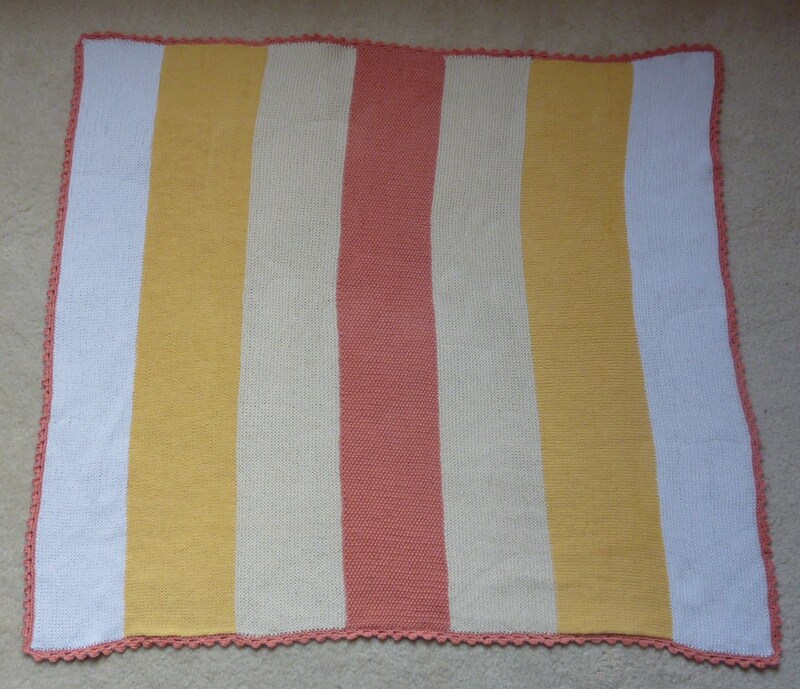 Especially as blankets are such a keepsake item, you often hear about babies loving their blankets so much that they take them everywhere, I do hope that this might be that blanket for our friends little one! This combo was an order from a friend and old colleague of mine. I actually taught her how to knit a couple of years ago and she made the cutest little baby blanket for a friend of hers who had a little baby girl. We used to have regular knitting evenings, during which we always had baked Camembert for dinner…yum! 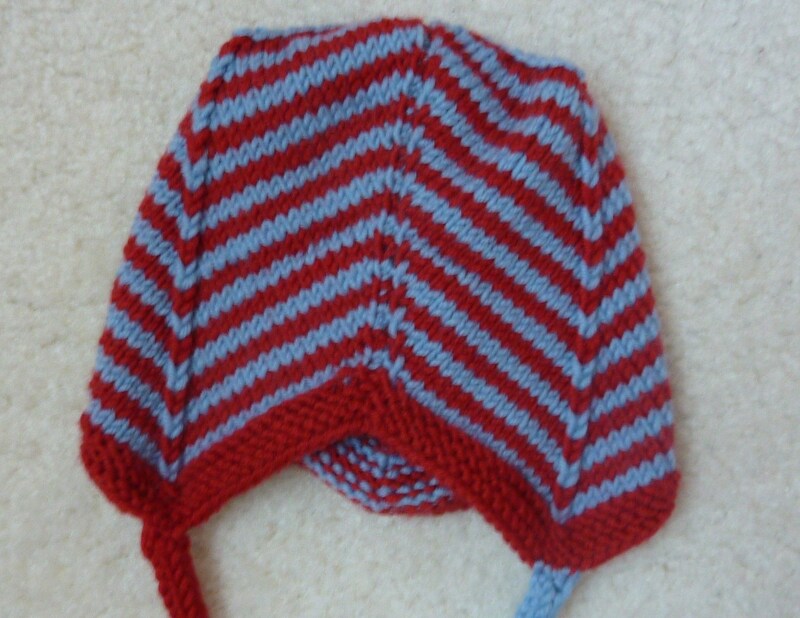 The bonnet is the same pattern from the folk at Garnstudio. 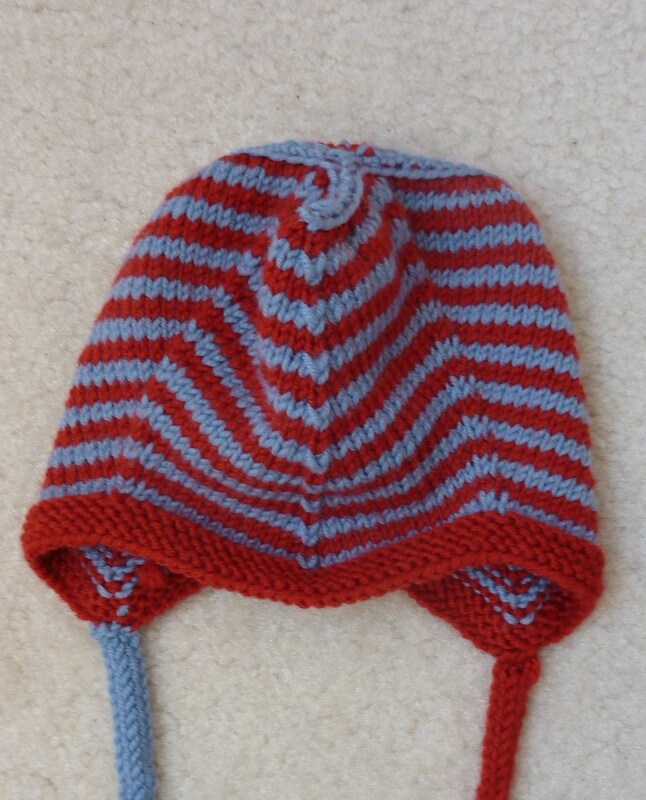 I decided this time to actually use thicker yarn, which I think has worked out really well. We picked the red and blue as we didn’t know whether it was going to be a boy or girl, in fact I still don’t know. Maybe I should check with my friend, as I think the little one arrived late last year. 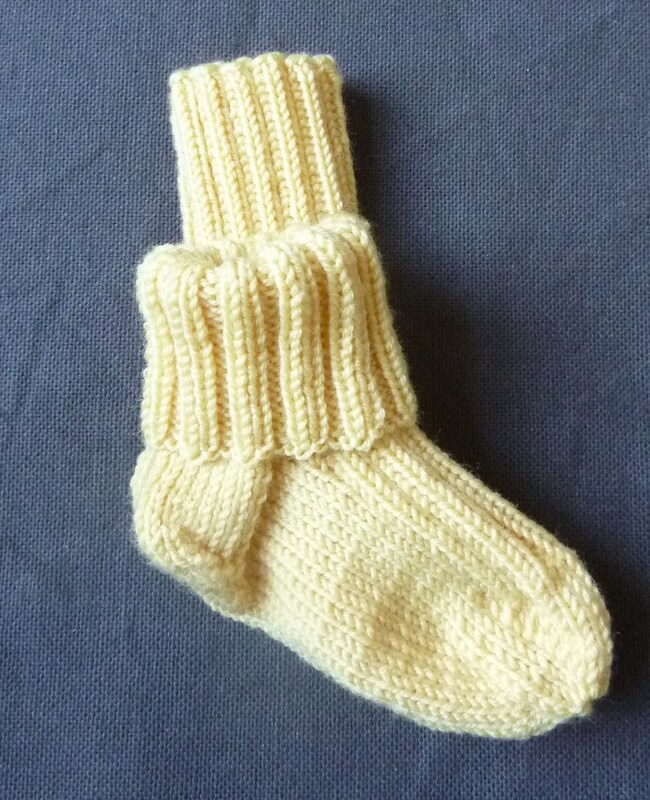 I also decided to make a pair of socks, rather than my usual booties. I love how these have worked out, and think the combination of the two different colours is ingenious (even if I say so myself :-)). All together, I think this was a good gift and I’m sure the recipient loved them. 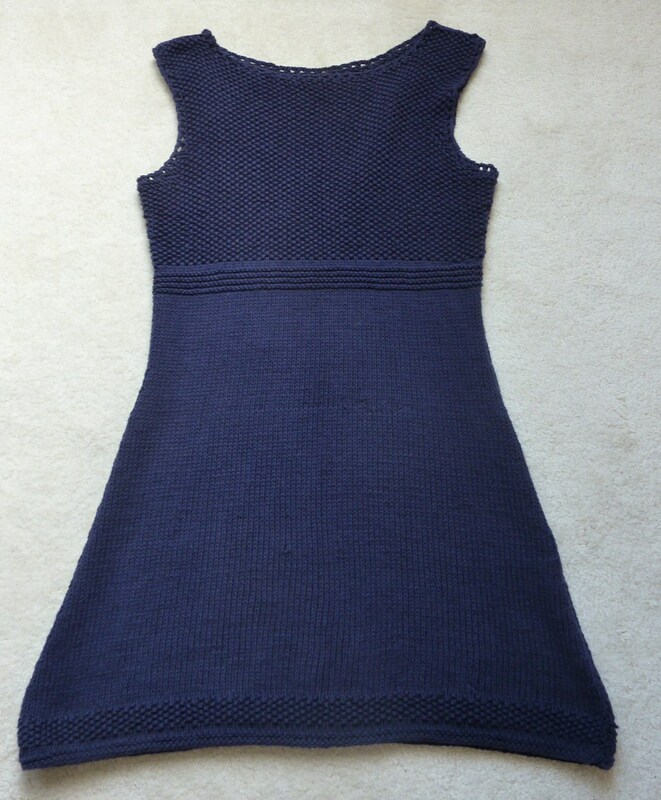 This dark blue dress, made from cotton is from a pattern from the folks over at Garnstudio. It was one I worked on just before the summer last year and wore a couple of times during the summer. 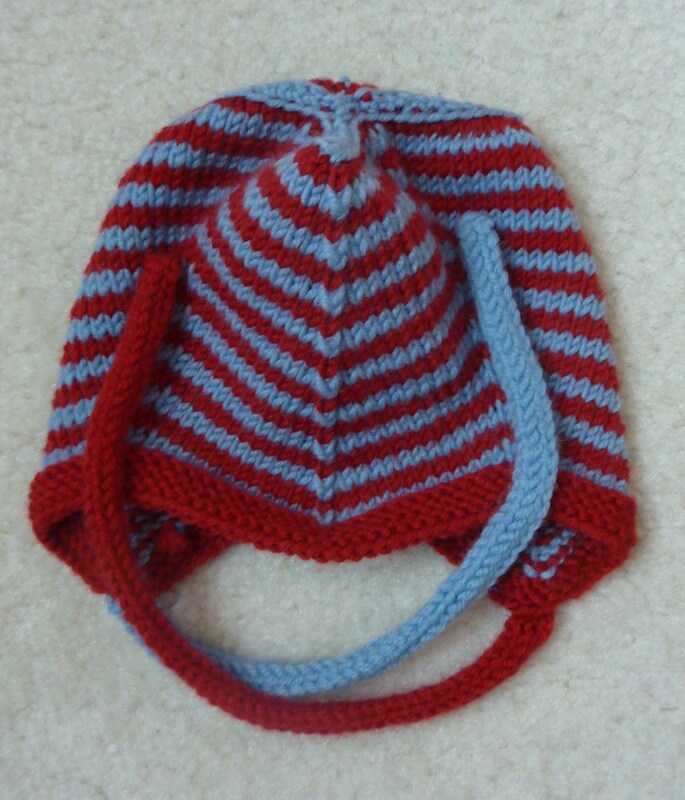 It was a great, easy knit, which might be down to the fact that the pattern calls for Drops Paris, which is a nice thick cotton yarn. I did make the mistake of knotting together the different balls of yarn, which meant that when it came to finishing it there were a few bits that just didn’t look as nicely as I wanted it to. 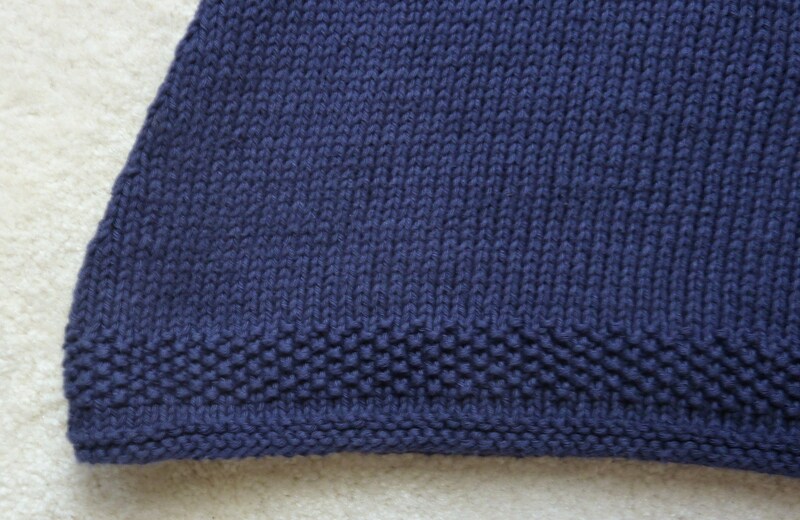 I have to admit that I normally love knitting stockinette stitch, but I did get a little bit tired of it towards the end, so I was really looking forward to the moss stitch. I also think it looks quite nice at the bottom, as it starts off the dress very nicely. I do think the colour works really well, especially as it can be teamed with a nice white blouse/shirt or a nice white top. There are so many different options! 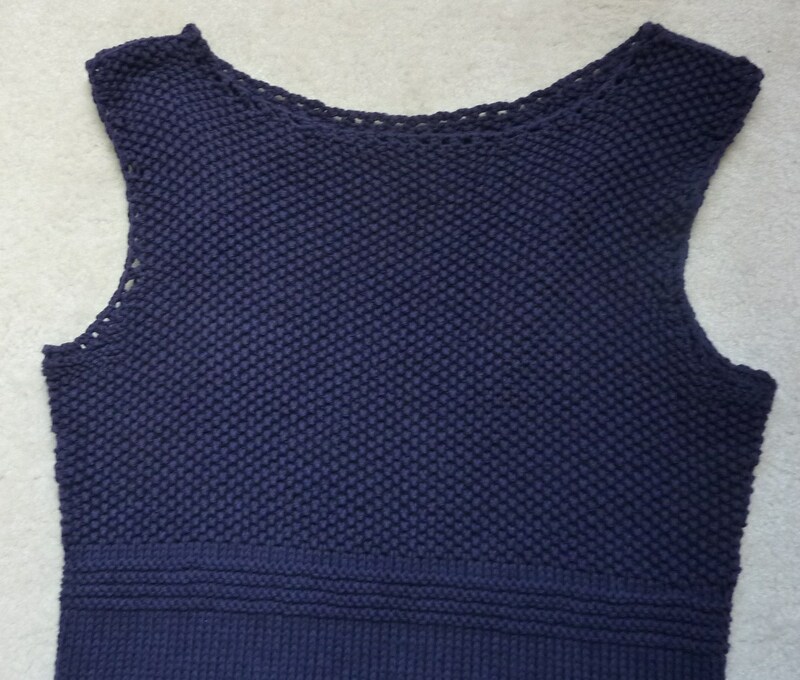 And the crochet border finishes off the dress quite nicely I think. I’m looking forward to wearing this again this coming Spring/Summer, once I’m not pregnant any more and have lost some of the extra weight :-). Today, for something completely different. I’ve just come back from seeing La Soiree, the second production behind the team that did La Clique a few years ago. And I’m in love (again). It’s the most fantastic cabaret/show/circus/etc. I’ve ever seen. I couldn’t stop laughing and my throat is sore from all the screaming. The absolute best act of the show is ‘bath boy’. He basically does gymnastics with two bands from the ceiling, out and in of a bathtub, it’s simply inspired. If you ever get the chance to go, I urge you, it’s the best evening of entertainment you’ll ever experience!